The formation, ascending broadening wedge is called this because of its similarity to a rising wedge formation and then has a broadening price pattern. 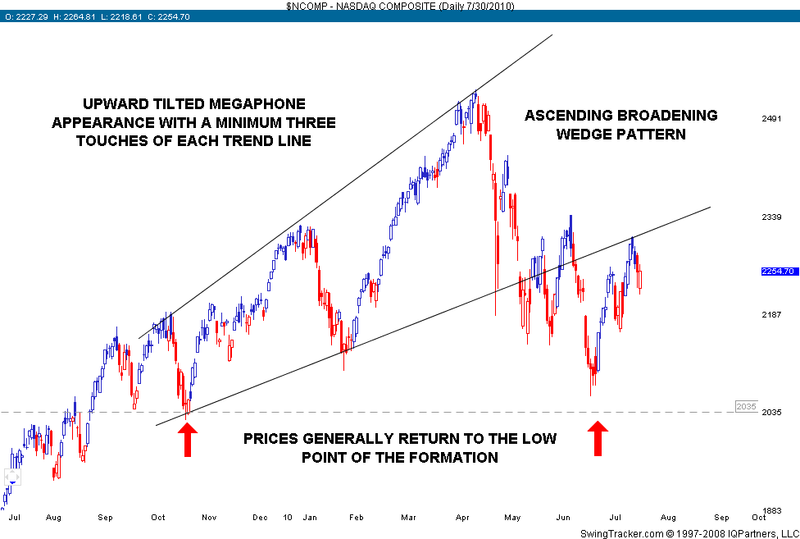 While symmetrical broadening formations have a price pattern that revolves about a horizontal price axis, the ascending broadening wedge differs from a rising wedge as the axis rises. The upper trend line of an ascending broadening wedge goes upward at a higher rate than the lower one, thus creating an apparent broadening appearance. The ascending broadening wedge formations volume is likely to increase ever so slightly as the breakout advances. The patterns are very trustworthy once a downside break happens, however they are less reliable prior to the break of the lower trend-line. Thomas Bulkowski’s Encyclopedia Of Chart Patterns notes the failure rate for this pattern formation is 24%, however only 6% where a downside break occurs, suggests that once the downside break happens there is a possibility that a price recovery and a continued decline should be expected. Once the decline begins prices will most often decline to, or below, the start of the formation. The two sloping trend lines are the most obvious thing you will notice; the upper one will have a slightly steeper slope than the lower one and the trend lines will then spread out over time while both slope upward. When prices break through the lower trend-line they will tend to drop quickly. Price movement is contained and alternates between the two non-parallel trend-lines. This is indicated in the below chart. On many occasions, these formations will appear towards the end of a rising price trend and signal a reversal. A partial rise does not predict a change in trend. The upwardly tilted megaphone shape. Both upper and lower trend-lines will slope higher. The upper trend-line will have a higher slope than the lower one, giving the appearance of a broadening formation. Each trend-line should have a minimum of three touches, or close to that. Volume normally rises as prices move up and declines as prices move down. Volume tends to rise over time in most cases. In the case of a partial rise going towards the end of the pattern, prices start moving upward, after having found support at the lower trend-line, then stop prior to touching the upper one. Prices will immediately return to the lower trend-line and normally head lower, breaking towards the downside. In Thomas Bulkowski’s Encyclopedia Of Chart Patterns, only 6% of the formations breaking out downward will fail to continue moving down by more than 5%. This is an exceedingly low figure. Also there is a 76% chance that the formation will break out downward. It therefore pays to wait for a confirmed breakout. The measure rule for this type of formation will differ from most other formations in that it will be based on the lowest daily low, not on the height of the formation. The low serves as the expected minimum price move. Again this formation is a good account for downside breakouts. About 1 in 5 will see prices movement horizontally or even break out upward. Holding out for the downside break is the favorite approach and considerably increases the possibility of a profitable trade. When prices begin to decline below the lower trend-line, think about a short position and then be prepared to cover when prices approach the target or at the next closest level of price support. Provided that you identify a partial rise, consider taking a short position since around 8 of 10 cases show a downside breakout following a partial rise, because you will have a ‘heads up’ profits should be larger. If this approach is taken, as the trade advances the lower trend-line, consider tightening your stop-loss in case price reverses, thereby protecting your position.